The minimum requirements for a maximum of fun are a weight of 30 kg, a size of 120 cm, and a minimum age of 8 years. With the Zip Line Stoderzinken, a rope gliding system in the Austrian adventure park Gröbming, you can get very close to the dream of flying, and that without a pilot's license and with minimum risk, also because TUBUS profile dampers supplied by ACE are involved. If you like gondola lifts or rope systems on playgrounds, you will love this facility, which, according to the operator, is the largest zip line in the Alps. It offers 2,500 m of fun at speeds of up to 115 km per hour. A strap-carrier construction ensures maximum safety and comfort. Since the start of the zip line, these aspects have been improved by Engineering-Mechatronics GmbH from Austria because slowing down was not as comfortable as it is today. Back then, tires were waiting for the users at the end of the zip line. Although the ride in its final stage was by far not as fast as in the steepest sections, the rebound effect in the end position was more massive than what children were used to from playgrounds. This was not dangerous, just at times a bit uncomfortable and left a not-so-nice lasting impression. Therefore, Thomas Liebmann, managing director of Engineering-Mechatronics from Piesendorf in Austria was commissioned by the operators of the zip line. He then contacted ACE Stoßdämpfer GmbH in Austria to find a suitable damping solution. Hans-Jürgen Greindl, based near Linz and ACE’s specialist for braking and damping solutions of all kinds in the Alpine Republic, suggested TUBUS profile dampers. From similar applications in the past he knew that their compactness is a decisive advantage of these machine elements. In addition to an easy installation in the end positions of the existing construction, they also provide extra protection with their ability to being fitted inside the so-called rope runner, the rollers of which are used for the transport of the passengers along the zip line. 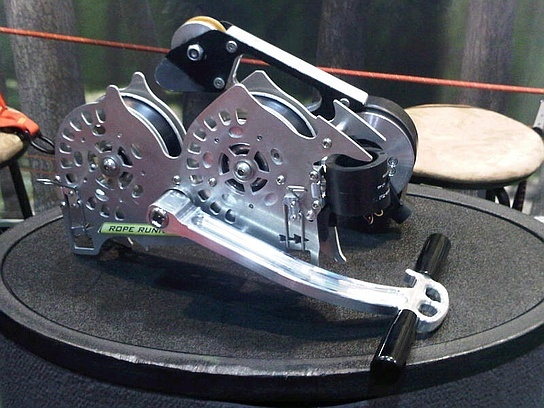 Whereas the engineers usually determine which profile damper works best by using exact data and formulas and then use ACE’s selection of eight TUBUS product families and more than 140 individual products, the case of the rope runner took another path: "In preparation, as sometimes done in the mountains, we used the rule of thumb by taking our shoe sizes times two," said Hans-Jürgen Greindl of ACE jokingly. In other cases ACE would be able to come up with an absolutely precise dimensioning beforehand, he added in the next sentence, but in this case, the success proved to be right for the rough estimate of the mountaineers. After all, the selected machine elements of the TUBUS type TR67-40-OS have been working well, executing all duties placed on them excellently. Made of co-polyester elastomer, the maintenance-free, ready-to-install construction elements come in a space-saving design with an outer diameter of 67 mm and a stroke of 40 mm. They are capable of absorbing 23 Nm per stroke at sustained loads and 33 Nm per stroke in emergency stop applications. Although deceleration in the valley at the end of the trip is part of the layout of the whole construction, the process of braking can still be classified as an emergency stop. While the breath-taking trip only takes about a minute, due to the longer return of the zip line and the check-in of the next passengers, each stop only happens about every 45 minutes. Compared with an around-the-clock use in automation or in handling, this case does not put the TUBUS under continuous load in the actual sense. 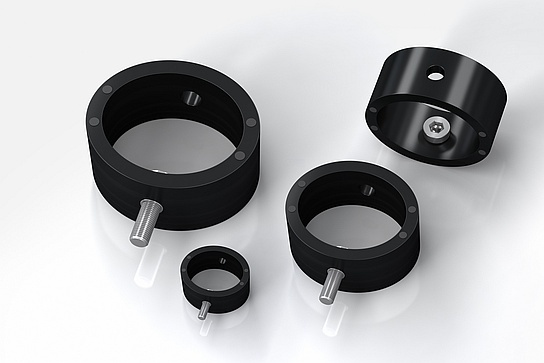 The life of ACE’s profile dampers can amount to about 1 million load changes and their permissible temperature range of -40 °C to 90 °C also allows operation in the winter months. With their radial damping they provide very long and soft braking. For other cases, ACE offers products with degressive and nearly linear characteristics. All members of the extensive TUBUS family share the common trait that they can always be used as a cost-effective alternative to hydraulic safety shock absorbers or even industrial shock absorbers when immediate stopping without rebound is not required. In these cases, as in Austria, customers benefit from lifetimes that are many times better than competing solutions such as dampers that use polyurethane, rubber or steel springs. 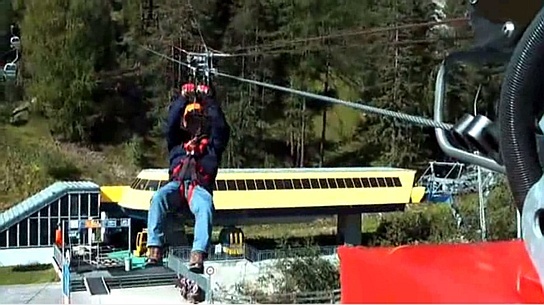 Therefore, the zip line and the rope runners not only work for the pleasure of the guests enjoying the short flight, but the whole solution also has the blessing of the Austrian technical inspection authority.